Niamh O’ Leary is a twenty year old student at Mary Immaculate College Limerick and is currently studying Primary Teaching. After attending the training centre of Finuge and completing three years, she succeeded in gaining a place in SiamsaTíre as a community cast member at the age of nine years old. Since then, Niamh has had the opportunity of taking part annually in the Summer seasons. She has been in shows such as San Am Fadó, Clann Lir in which she plays one of the swans, Oileán in which she has played the part of the girl emigrating, Tearmann and finally Moriarty. 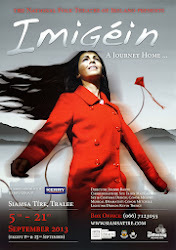 She is now grateful that she has the opportunity to be a part of the new show Imigéin. Niamh has been very lucky to have had the opportunity to travel with Siamsa Tire to places all over Ireland and Venezuela, South America. She also appreciates the opportunities in which being a member of Siamsa has given her such as working with very talented choreographers and musicians as well as her fellow cast members. I remember my audition in the training centre - aged six. Touring all around Ireland and going to Venezuela, South America! Niamh has performed as one of the SWANs in Clann Lir!